YOU have probably seen the work of Spanish craftsman Cecilio Castrillo, who hails from Burgos in northern Spain, but you don’t know it yet. The horned masks made by this talented artist were worn by Madonna’s dancing troupe the night she took a tumble – and went viral – at this year’s Brit Awards. Other celebrity clients crazy for Castrillo’s work include Lady Gaga, Beyonce and rapper Brooke Candy. The nose-pierced 36-year-old artist said LA’s luvvies were perplexed by his low-key demeanour when he took his up-and-coming brand, Leather Designs, across the Atlantic. 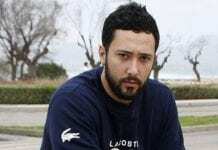 “They were expecting someone much darker, much more sophisticated than me,” said the Spaniard, whose career has come a long way since he started street-selling outside nightclubs in Ibiza. I am sure there must be a massive demand for these….sigh and roll eyes.